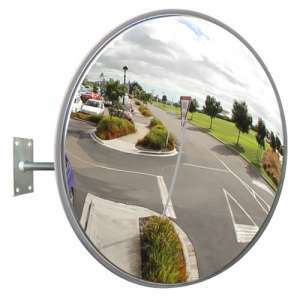 The Outdoor Heavy Duty Stainless Steel Convex Mirrors are most suited for situations where vandalism and projectile objects are a risk in industrial or road safety situations. The stainless steel mirror face can take the hard knocks from an industrial environment and in vandal prone areas, graffiti can be easily removed. 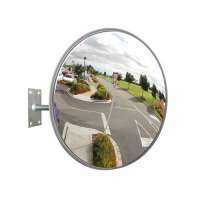 The 18 gauge highly polished stainless steel mirror face is specially curved to allow drivers to see around blind corners and hard to see entranceways and driveways without distance distortion. The easy to install galvanised steel wall mounting bracket (pole mounting u-bolts are also available) is fully adjustable to any angle to give the most effective view. 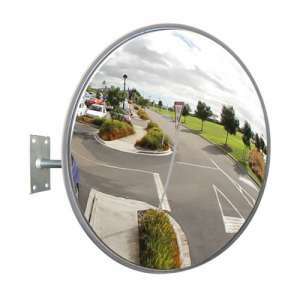 The 24" Heavy Duty unbreakable stainless steel convex mirror is most suited for situations where van.. The 32" Heavy Duty unbreakable stainless steel convex mirror is most suited for situations where van..